Soundiron’s original Ambius release received a glowing review from Martin Walker in SOS November 2010, since when the concept has gone from strength to strength. 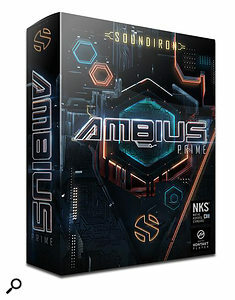 The entire series is now available as a single collection called Ambius Prime (9.15GB installed), which bundles Ambius 1 — Transmissions with Ambius 2 — Systematik and Ambius 3 — Expanse; the first two can be bought separately, but Ambius 3 is only available as part of the Ambius Prime bundle. The libraries run on both the free Kontakt Player and the full version of Kontakt (version 5.6.8 or later). The libraries were created from organic field and live instrument recordings, which have been processed to create over 3000 original hybrid sounds. These have been whipped up into a huge array of pads, drones, ambiences, pulses, evolving textures and leads of a distinctly experimental nature. Not the kind of thing required by a keyboardist playing in a country rock band in deepest Virginia, but likely to be of great interest to soundtrack composers, creative pop producers, left-field songwriters, sound designers and the wider community of intrepid sonic adventurers. At the heart of the Kontakt GUI is an assignable X/Y pad, a virtual joystick which allows you to morph between four layers; you can adjust it manually, or set it to create a rhythmic motion which syncs to your host tempo. Each layer has its own sound-shaping options, including attack, release, sample offset, pitch and 39 built-in filter types; the layers’ volume, pitch, pan, filter frequency and resonance can also be modulated. Monophonic glide, an on-board arpeggiator and a Kontakt effects rack emblazoned with virtual band bumper stickers add to the fun. This unorthodox set contains some gems. I liked the menacing, other-worldly pulsing shudder of Ambius 1’s ‘Shiversparkle’ (which evoked visions of a monstrous alien industrial assembly line) and appreciated the subversive ear-shredding scream of ‘The Shakes’, like fingernails on a digital blackboard. By way of contrast, the library also features lovely, tranquil-sounding pads. Unleashing the arpeggiator on Ambius 2’s ‘Filter Slide’ preset yielded some great, bubbling percussive 1950s Radiophonic Workshop-style sequences, and I’ve made a mental note to dial up the library’s massive ‘Deeper Purple’ drone if they ever ask me to write the music for Blade Runner 3. Moving on, I enjoyed the ethereal, slightly unsettling atmosphere of Ambius 3’s ‘Domick 1’ sample. While many of that library’s presets are impressively complex, I found that disabling the X/Y pad motion and auditioning individual layers often revealed more generally usable material — for example, turning off the two cheesy Tron-style sequences built into the ‘Psychedelic Anxiety’ preset simplified and improved the overall sound. This points to the fact that while Ambius Prime has lot to offer at surface level, further rewards await those who take the time to investigate its deeper features.